PaidSocialMediaJobs.com Reviews - Legit or Scam? 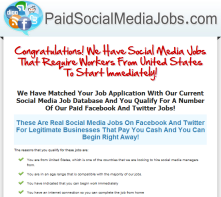 PaidSocialMediaJobs.com Reviews – Legit or Scam? PaidSocialMediaJobs.com is a new website dedicated to helping average people find work at home jobs in social media management, which they claim is currently the highest demanded job in the country. Paid Social Media Jobs says that all companies, from the largest to the smallest, are starting to realize that they need a presence on social media sites like Facebook and Twitter in order to stay competitive. But many of these smaller companies cannot afford to keep a full time social media manager on board, so they are outsourcing the work to independent workers who can do the job entirely from home. PaidSocialMediaJobs.com claims that the best part of becoming a social media manager is the newness of this position. Since this job has only been created in recent years, there is no one out there with a collegiate background or formal training in this field. The field is literally open to everyone. However, Paid Social Media Jobs claims to be able to give you a leg up on the competition by not only connecting you with companies that are searching for social media managers, but also by training you. Their training focuses on how to apply for these jobs, what to say in interviews, understanding what will be expected from you in this position, and – most important – how to be a successful social media manager. In exchange for all of the training and knowledge you will be supplied with, you are expected to pay a one time fee of $77.00. If you choose, you can take a 3 Day Trial for $1.00 to see the kind of information you’ll be given. If you aren’t interested in the job opportunity, you can cancel before your 3 Day Trial is over and receive no further charges. But if you would like to move forward, you simply do nothing and at the end of 3 days you will be charged $77.00 and receive your full membership benefits. Also, visitors should be aware that PaidSocialMediaJobs.com does share your contact information with third parties for advertising purposes, so keep this in mind when giving them your email address. Paid Social Media Jobs ? Average Rating for " Paid Social Media Jobs " is 1.33 out of 5 based on 6 reviews. Massive scam!!!! Instead I found share-earn.co.uk it's not a massive amount of money but at least I made couple of hundreds £ in a month spending an hour in Fb. I I do believe that if a company wants you to pay them for a job scam. Go to the support email address on are on their site I've got no response after sending it several times then I came here and found these reviews so of course confirmed my first thought scam! I have been applying for jobs on PSMJ for over three months now. I paid a subscription fee through PayPal but it's been two weeks, I have not had a response. Instead I am getting more emails about jobs which I have already applied for. Let's be honest from the outset: any company that requires you to first pay them a fee before they they can pay you is nothing less than a scam, similar to pyramid schemes. I first heard of this website because they started spamming my blog. No respectable website spams; it could be considered illegal and is almost certainly against Google's terms and conditions. DO NOT SIGN UP TO THIS SITE! If you want to earn money online, consider doing some freelance work for websites like Textbroker or Populis. Never, ever part with you money for websites such as these; they're supposed to pay you for doing the work. ANYONE who wants you to pay a fee up front is a SCAMMER!!! DO I need to repeat myself?? Dont go for this crap people you'll get burned!